Dr. Hank Edmunds and his wife, Martha Mel Edmunds, attended the November 2014 STSA Past Presidents Dinner in conjunction with the STSA 61st Annual Meeting in Tucson, AZ. The STSA Inspiration Award was established in 2007 to recognize the important contribution of mentorship to the cardiothoracic surgery specialty and the Association, and to encourage upcoming generations of CT surgeons by helping to cultivate mentors worthy of emulation. The Award is given to the STSA member who has demonstrated exceptional efforts in motivating, inspiring, and cultivating the clinical and research talents of medical students, residents, and/or early career CT surgeons. L. Henry Edmunds, Jr., MD was named the 2015 Inspiration Award recipient by 2014-15 STSA President, John H. Calhoon, MD. During his term as Editor, the Annals expanded dramatically. His many innovations to the Annals have, in large part, explained its now global reach. As Editor, Dr. Edmunds insisted on the highest quality of scholarship and rigorous peer review. 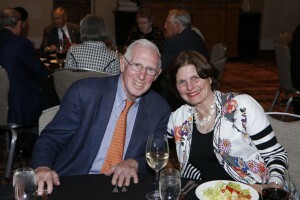 His insightful commentary and advice on countless manuscripts have has a profound effect on the academic productivity of many members of the Southern Thoracic Surgical Association. Dr. Calhoon, announced Dr. Edmunds as the 2015 Inspiration Award recipient during the 62nd Annual Meeting Awards Dinner & Dance on November 7, 2015 in Lake Buena Vista, FL. STSA members will again have the opportunity to nominate a surgeon mentor for the Inspiration Award in 2016. Nominations should outline the specific merits of the nominee and his or her positive influences on the mentee(s). The recipient must be an STSA member in good standing. Submit nominations in writing to STSA and send via e-mail to stsa@stsa.org or mail to 633 N. Saint Clair St., Floor 23, Chicago, IL 60611. STSA President, Dr. Andrea Carpenter, will announce the 2016 Inspiration Award recipient during the STSA 63rd Annual Meeting Awards Dinner & Dance on November 12, 2016 in Naples, FL. View a list of past Inspiration Award recipients at www.stsa.org/awards. Contact STSA Headquarters with questions at stsa@stsa.org or 312.202.5892.